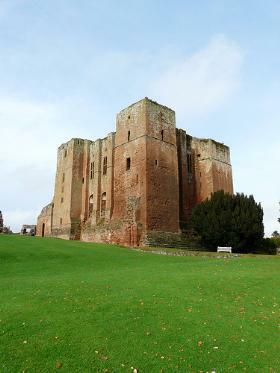 Kenilworth is an English castle in Warwickshire. 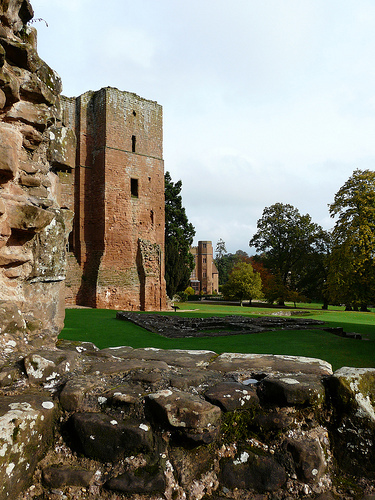 In 1265 the medieval castle at Kenilworth was granted by Henry III to his second son, Edmund Crouchback, Earl of Lancaster, and for the next three centuries it was passed back and forth between the crown and various noble families. In 1563 the castle was granted by Queen Elizabeth to her favourite, Robert Dudley, Earl of Leicester, who decided to convert the castle into a great house fit to receive occasional visits from the Queen. 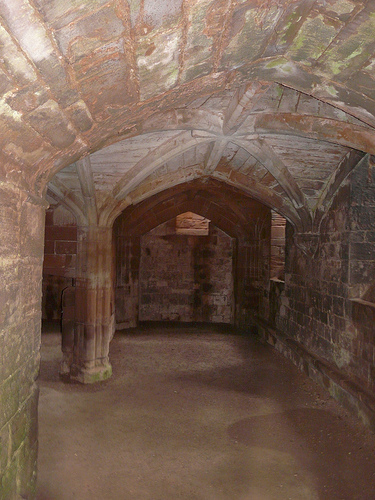 He retained the banqueting hall that had been built in 1392, and redesigned the Norman keep (built in 1120), inserting mullioned and transomed windows on the first floor and renovating the accommodation within the building. He also demolished part of the curtain wall to construct the magnificent guest house that has been known since the 17th century as Leicester’s Building. Dudley also built a gatehouse, beside which a large garden was laid out. The design shows indirect French influence, mediated through the English royal palace gardens. Like the gardens at Hampton Court Palace, Whitehall and Nonsuch Palace, Dudley’s gardens consisted of a square divided into quarters, laid out in Knot Gardens; at the centre of the square there was a fountain. 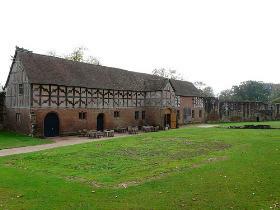 One important factor separated Dudley’s garden from those at the royal palaces: whereas the royal gardens could all be viewed from the state apartments on the first floor, the Kenilworth gardens could not be seen from the castle, and so a large terrace was constructed from which the gardens could be viewed. The terrace was decorated with obelisks and heraldic animals on posts; this distinctly English element, which also appeared in the fountain at the centre of the garden, seems to derive from the royal garden at Hampton Court. 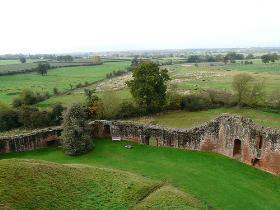 After the Civil War Kenilworth Castle was slighted to prevent any further use as a fortification. The damaged buildings subsequently fell into further disrepair and today the castle is a ruin. 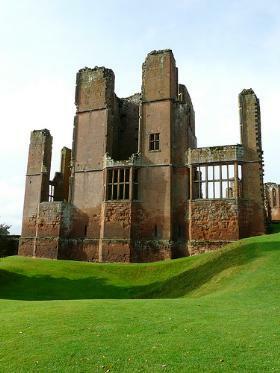 Kenilworth Castle is open for vistis all year around except in the winter holidays when it is closed between 24th - 26th December and on 1st January. For more information about opening times and tickets visit the Kenilworth official website.